Background material on the English Diggers, Levellers, &c.
In this chronological index and archive I have compiled the known tracts, manifestos, letters and other publications that the English Diggers left behind before retiring from the stage of social revolution. This is a quick definition of who the original Diggers were. Eventually I want to include a substantial archive of materials here about the English Diggers, and especially to talk about the similarities between the 17th century Diggers and the 20th century Diggers. I mean just read "about time we started doin our own livin and dyin" -- it's eerie, really! To make a gaole a gin, to starve poor men therein. The tithe they yet will have, stand up now. 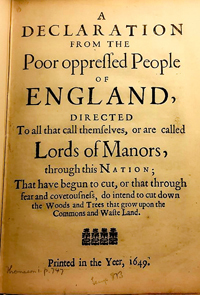 Cover of the second Digger manifesto, June 1, 1649. 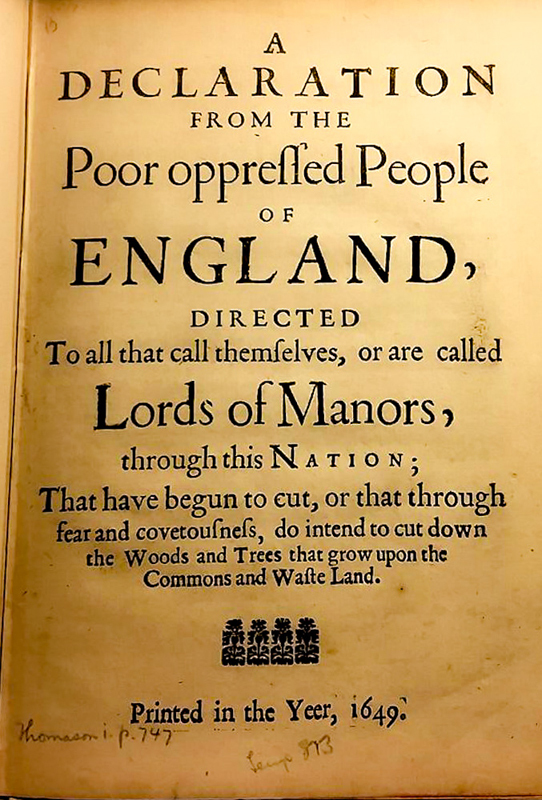 A Declaration from the Poor oppressed People of England.